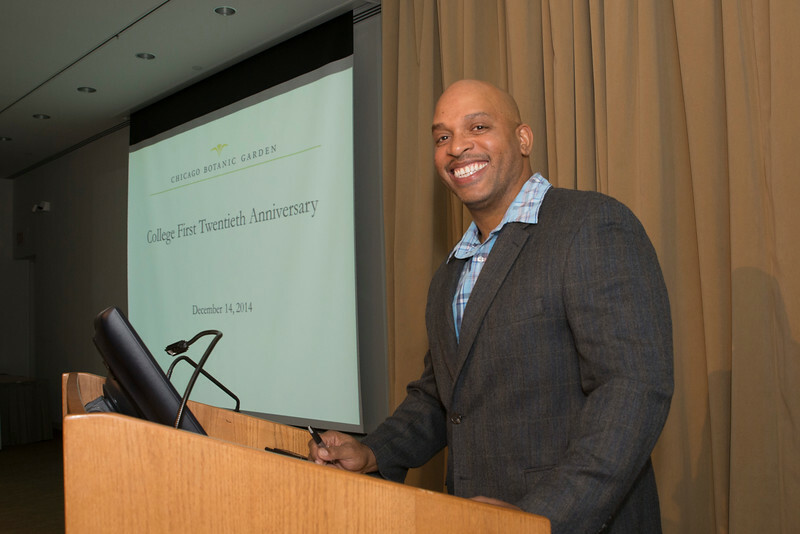 Twenty years ago, I was running school field trip programs at the Chicago Botanic Garden when then-education manager Alan Rossman received a grant to start a brand new program called “College First.” This program would use the Garden site and staff to introduce 12 students from three Chicago Public Schools to careers in the green industry. He hired retired teacher Gwen Yvonne Greenwood to coordinate the program and enlist staff from all over the Garden to mentor and teach these young people. These six students from 2003 are all college grads with jobs now. At the time, there weren’t many programs like College First anywhere in the country. College First was even unique among the other museum teen program start-ups, in that our goals were not merely to make the institution more relevant to this age group, but also to provide a springboard to meaningful careers in science-related fields. Who knew that 20 years later, with some changes and improvements along the way, this small program would evolve and grow into the Science Career Continuum we have today? We now bring 60 students (like Mely Guzman, whom I blogged about earlier this year) from all over Chicago to the Garden every summer and expose them to environmental and conservation sciences, with the hope that a few of them will be inspired to pursue a career in this field, and maybe go on to do something important for our planet. To date, College First has served more than 500 students from 116 schools. The majority of them have attended college and have entered—or are entering—productive careers. Many of them have pursued science-related careers as a direct result of their experiences at the Garden. Program manager, Amaris Alanis Ribeiro (standing on the right) reminds a group of former students to visit Wonderland Express after they are finished eating. 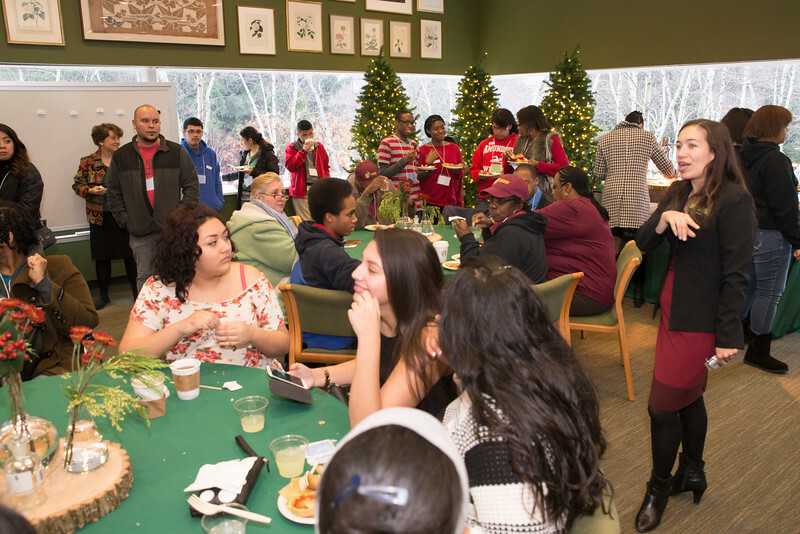 We celebrated the success of College First on December 14, with a reunion party at the Garden, including a visit to Wonderland Express, for all past students, instructors, mentors, donors, and their families. More than 200 people attended the event. In between the many reunion hugs, congratulations, and words of encouragement for current students, we gave all program participants an opportunity to reflect on their experiences by telling us their stories on video, writing comments on a talk-back wall, and tweeting about the event while a live Twitter feed displayed the comments. 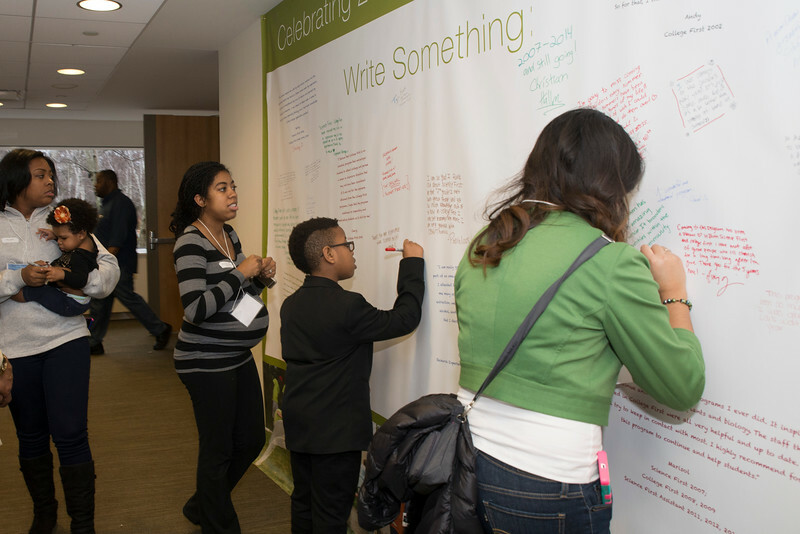 College First participants shared their thoughts and feelings on the comment wall outside the auditorium. A former program coordinator, William Moss, is now a gardening guru and media celebrity. (Even our instructors have moved on to great things in their careers!) William presided as master of ceremonies during a presentation to recognize all the people who have made this program possible. We honored staff mentors, Louise Egerton-Warburton, Jeremie Fant, and Tom Soulsby as outstanding mentors. The College First 20th Anniversary event was made possible by the generous support of Joel Friedman of the Alvin H. Baum Family Fund. Awards were presented to Annette Kleinman and family of the Sheridan Foundation, the W.P. & H.B. White Foundation, and the Lloyd A. Fry Foundation for their generous financial support over the years. William Moss—television celebrity, author, gardener, and all-around good guy—helped us to honor all the people who have made this program successful. For me, this was a very rewarding event. It was such a pleasure to see so many past and present students coming together and sharing in the success of this program, especially those who are now adults with spouses and children of their own. This group represents our scientific future. A total of 57 past and present College First participants attended the celebration and posed for a picture. Wow! I wish each and every one of these smart and talented young people a happy new year and all the best in their bright futures! Meet Melyssa Guzman. 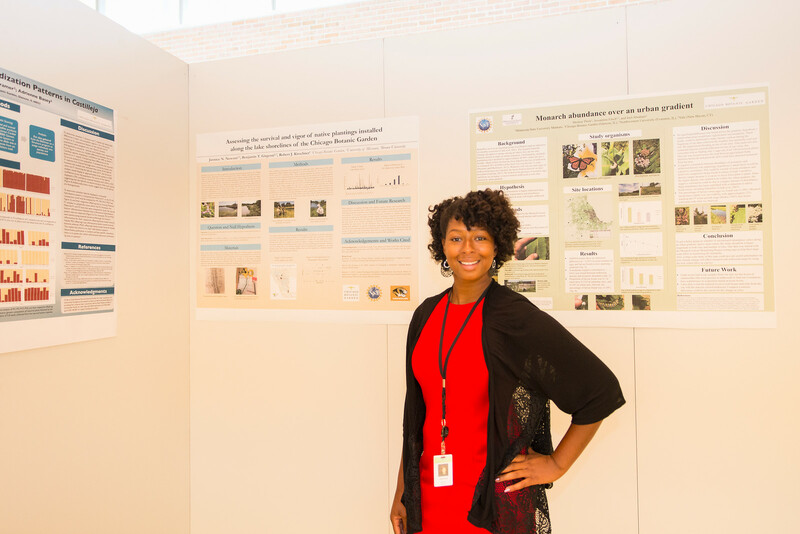 She is one of 20 College First students who spent eight weeks learning about environmental science and doing a research project at the Chicago Botanic Garden. 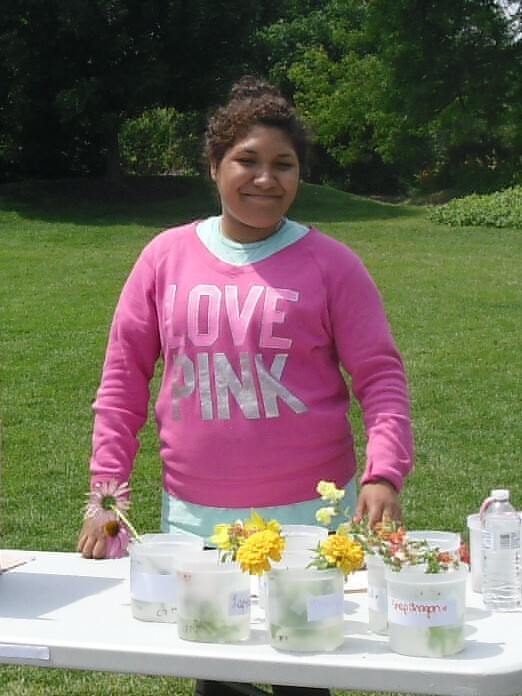 College First student Mely G. would like people to plant butterfly gardens in their yards. Mely, as she likes to be called, is a junior in the Chicago Public Schools district. She’s kind of a “girlie” young woman who wears a lot of pink, and likes flowery, feminine things. Mely also loves science. Each student had a staff mentor; I was Mely’s. 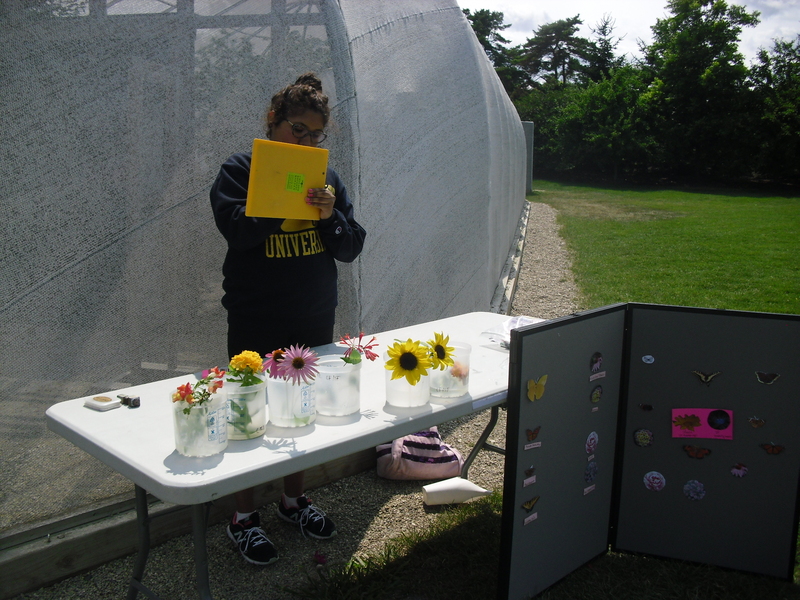 Her project was teaching the public about butterfly-attracting flowers. Although drop-in programs and exhibitions may be considered more “education” than “science,” understanding how people learn is an area of social science research that can challenge a smart student like Mely. This summer, Mely learned that museums and public gardens often test exhibitions and learning activities, using methods similar to those practiced by conservation scientists, to see how visitors will respond. 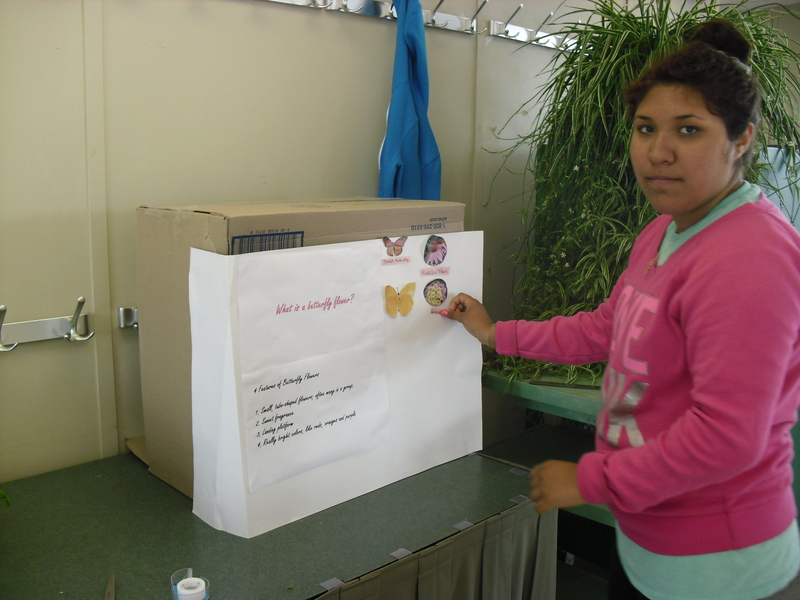 Mely began by researching butterflies and the flowers they prefer. Then she decided to set up a display at the Butterflies & Blooms exhibition, where she would teach visitors what flowers to grow in their yards to attract butterflies. The display would have different kinds of flowers—real flowers and pictures—and she would stand and talk with people who were interested. After each group of visitors, Mely recorded notes about how long they stayed at her table, and how interested they seemed. As kids today would say, her first try was an “epic fail.” Most visitors looked at her display with curiosity, but they seemed perplexed and did not stop to learn more. The display was lovely, with fresh flowers and pictures of native butterflies, but it lacked a clear focus. It needed something else to draw visitors in. The display board kept blowing over, which was another big problem. Mely brought the exhibit inside and modified the whole thing. Instead of using a folding display board, she mounted a poster board on a cardboard box so it would be more stable when taped to the table. She added a title, “What Is a Butterfly Flower?” as well as some facts about butterfly flowers. Then she tested the display again. After each group of visitors, she recorded the time they spent at her table, and gave them a score of 1 to 4 to rate how interested they were, the kinds of questions they asked, and things they talked about while looking at the display. Museum exhibit developers call this process “rapid prototyping.” Inexpensive mock-ups of exhibits are tested to ensure they work—that visitors enjoy them and get the intended messages—before the museum invests a lot of money on a permanent display. 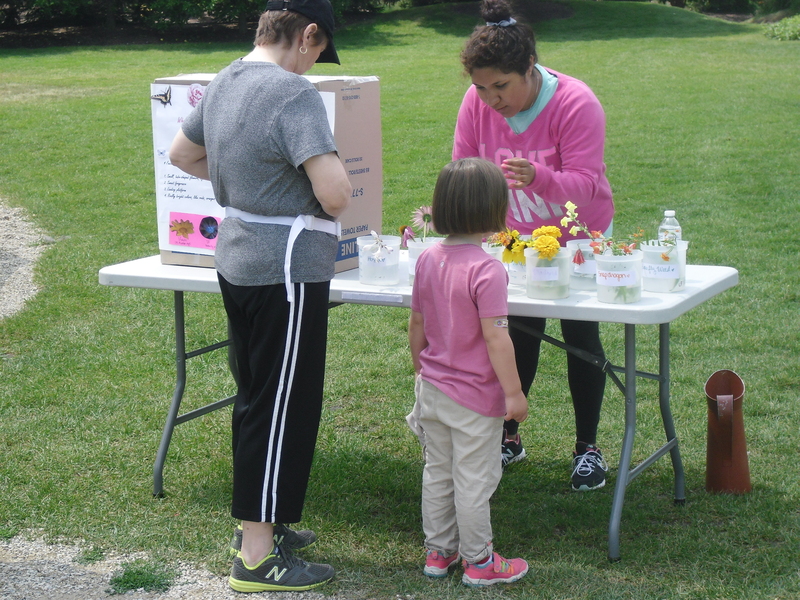 A mother and daughter listen as Mely explains what colors, scents, and shapes attract butterflies to a flower. Mely made a few more minor changes to her display. Then she tested a hypothesis. She observed that adults with children seemed more distracted than those without children; that they did not seem to talk to her as much as the childless groups. She hypothesized that adults without children would spend more time, ask more questions, and talk more about butterflies than mixed-generation groups. She used the data she gathered during prototyping the display, analyzing who stopped by her table, how long they spent, and how engaged they were. Surprisingly, she discovered that families with children actually spent a little more time on average than adults alone. She thought this may be true because adults who brought children to her display spent their time explaining things to them instead of talking to her. In other words, the adults were not distracted, but were directing attention on their children to help them also learn from the display. Mely does not fully realize that she has stumbled upon a very significant principle of learning: that learning is social. Educational research has shown that interaction between family members has a positive influence on learning in museums and in other environments. 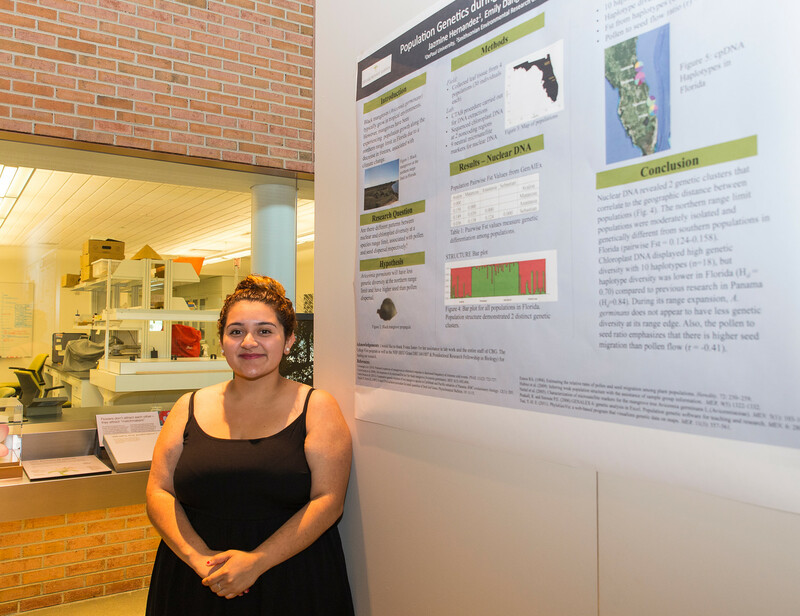 I’m very proud of Melyssa’s accomplishment this summer, and I look forward to seeing her expand her research next summer—because we both learned something!